In the following essay, Dr. Moul lays out his personal observations from a recent trip to North Dakota. The Mountain-Plains have been both blessed and cursed by the 200-year history of the riches found beneath our feet. We wish our brothers and sisters to the north well during this latest boom cycle and hope that they can borrow from the positive experiences of past cycles. To that end, we have extended an invitation to several of our friends in North Dakota to bring us fresh news of how they are attempting to minimize the downside of exponential pressures on population, institutions and infrastructure, while maximizing the potential for long-term economic growth and civic improvement. Imagine a typical rural farmstead on the Great Plains: a stately house, large lawn, outbuildings and a protective line of pine trees on the north edge. Now, fill that lawn with 10 to 12 trailers and recreation vehicles, parked willy-nilly with no hookups for electricity, water or sewer. That is a typical rural farmstead in the northwest corner of North Dakota. Along with the farmsteads, picture tidy but long rows of trailers packed onto a rural site along a highway or trailers sitting in most parks and driveways of towns and villages or large sterile-looking dorm buildings lined up with showers, mess halls with four-star chefs and laundry and recreation areas. These all are “man camps” holding thousands of Oil Patch workers come to produce millions of gallons of oil every day from the Bakken formation underlying an area of 18 North Dakota counties, plus eastern Montana and southern Saskatchewan in Canada. They have transformed the sleepy prairies of northwest North Dakota into one of the largest oil booms in North America. New technologies for fracking oil-bearing rock since 2000 are responsible for this rapid development. Wells are drilled horizontally into the formation (up to two miles below the surface), then using explosives or blasting water, sand and chemicals under high pressure are forced into the formation. This fractures the rock and allows the oil to pool for extraction. Between 5 and 10 percent of the oil in the formation is captured. 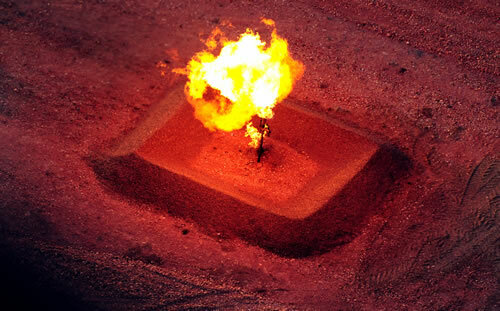 The explosives used for fracting are small cone-like shells, or shaped charges, known as perforating guns, lowered deep into the wells and ignited with an electrical charge. They form channels for the oil to flow into perforated pipes, then it is pulled to the surface. Estimates of the recoverable oil reserves in the Bakken have grown from 3.5 billion barrels when fracking began to 24 billion barrels now, as thousands more wells have been developed and production has skyrocketed. Some estimates go as high as 45 billion barrels. If the 24 billion barrels (for example) were extracted over a 40-year period, at $100 per barrel, gross wealth from the oil fields would be $2.4 trillion. Future development of better technologies to tap those reserves through refracking time after time could increase the overall treasure. However, if oil prices drop below $60 per barrel, fracking becomes unprofitable. This phenomenon has created an almost unsustainable boom in North Dakota, with high environmental, social and infrastructure costs. Oil pipelines into the area have long been filled with the product, meaning that it must now be shipped by expensive tanker trucks and rail cars. The trucks are everywhere, raising clouds of dust on country roads and pounding highways into rutted trails. On a recent visit to Watfort and Williston, towns at the epicenter of the boom, I saw a frenzy of activity at all hours. I was lucky to get a reservation at a Watfort hotel for one night and was put on a waiting list for a room the next night. These rooms are usually booked up for months ahead. Local businesses are overwhelmed and find their employees have gone for higher wages with oil companies and supporting firms. Cities and villages can’t keep employees to maintain public services. The closest college, Dickinson State University, has suffered a precipitous decline in male students, who find high-paying jobs easily. One Nebraskan with a personal history of all this is Mike Ayars of Ayars & Ayars construction in Lincoln. His firm is finishing a multimillion dollar project for a manufacturing building in Williston and has had a crew living there since last December. “We were real lucky—we were able to rent a trailer for seven men for $7,000 a month,” he said. He used no local workers because they aren’t available and planned on bringing all equipment and tools from Nebraska, although he did have a solid local connection for concrete. His crews worked for three weeks straight before returning for time off in Lincoln. Lines at fast food restaurants can be an hour-and-a-half long and the Walmart store there is reputed to be the number one store in America. They don’t unbox and shelve goods, just open the boxes for quick and easy access, Ayars said. Sites for buildings such as Ayars was constructing are rare by now, and require more preparation. His site preparation alone was a $990,000 job. Ayars is very happy with this project, but he is also being very careful about future work in North Dakota. “This is oil business. The bust will come and no one will see it coming,” he said. For example, a judge or the federal government could rule that fracking is an unsafe and environmentally disastrous practice, and shut production down instantly. And that could happen anytime. Smaller-scale fracking projects are being done or being planned across the U.S., and problems are surfacing. Tap water that can be set on fire, earthquakes believed to be caused by fracking, polluted land and water and the growing problem of what to do with toxic waste water and chemicals from the process are occurring in many states. Water is another major problem in North Dakota. Millions of gallons of it are used every day by fracking wells, and much of it must be trucked in. The Missouri River and Sakakawea Lake are the major surface water sources, but many entities from municipalities to industry and, especially, agriculture also depend on limited surface and groundwaters. At night, this corner of North Dakota is dotted with roaring flames as natural gas is flared through large candle-like pipes or inside round berms. The gas, a byproduct of the fracking, can’t be captured now because there are no pipelines to transport it or plants to process it. The oil boom developed so fast and oil companies are so anxious for profit that they can’t make long-term plans to fully develop all the underground resources. Another company may get ahead of them. So gas, a major natural resource, that formed and matured over millions of years now escapes into the atmosphere or is burned all day and night. It is another sign of a boom that is going bad. For more information on the Bakken oil field and the North Dakota oil boom, visit http://www.blackgoldboom.com, the site of a multimedia public media project exploring how oil is changing western North Dakota. 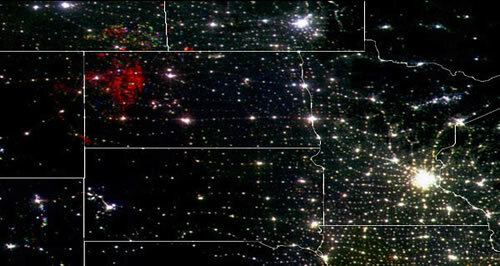 In March 2011 Kavitha Chekuru of Al Jazeera did a feature on the boom, titled, “North Dakota’s Black Gold Rush”. Another source of satellite imagery and environmental information isSkytruth.org.